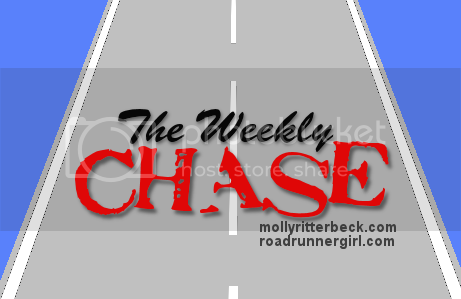 Road Runner Girl: The Weekly Chase #156! Hey everyone! Well the holidays are officially over and this girl is bummed about it. We go back to school and work tomorrow. It seems like these two weeks just flew by! We had so much fun during our Christmas break! We had a great New Year's Eve bringing in the new year! We went to our friends Kirstin and Jim's house for an appetizer dinner and a night of games. They introduced me to Mexican Train Dominoes and it has become my new favorite game! While the adults played games and watched football, the kids played and sang karaoke. They had a blast! Before we knew it...it was time to bring in the New Year! Happy New Year!!! So much fun! We headed home around 12:30AM. I slept in but knew I needed to get my run in for my streak. Even though it was late the roads were so quiet! I think I was the only one out there lol! Later that day we met friends to see the movie "Star Wars" for the second time! It was just as good the second time around! And yes...Kirstin and I bought matching Star Wars shirts a few months ago just for this movie!!! After the movie Kirstin and I met Jenny, her daughter Lily, and Leigh (who was in town from Birmingham) at Starbucks. My favorite barista Marlon was there and he gave us free drinks! SO sweet!!! And yes this was probably my last Chestnut Praline latte until next Christmas. I was so glad they still had some left! After Starbucks we were starving so we called the husbands and kids and met them all for pizza! Jenny and I had to carb up for our long run the next day after all! Saturday morning Jenny and I had a great long run! I'll tell you more about that on Wednesday! Later that afternoon we headed to Kirstin and Jim's house for dinner and more Mexican Train Dominoes! She remembered to give me my Christmas present....the Starbucks You Are Here mug from Virginia...her home state!!! I LOVE it and of course had to drink out of it when we all had coffee later! Sunday morning we went to church. Later that afternoon we headed up to the high school track. My Sole2Soul Sisters running group was starting a new couch to 5K group! I just love encouraging these ladies that have never run before! Goal #1: Run every day! Yes! I've kept the run streak alive all Christmas break! Goal #2: Roll, stretch, and ice daily. Yes! Goal #3: Maintain my weight by logging my calories. Yes! I've even been down a little in my weight. So glad I didn't gain any during the holidays! Goal #4: Move 11,000 steps or more each day this week. Yes! I had to walk around my living room a few times to get the steps in but I did it! Goal #5: Run at least 1 run under 2 miles. Yes! Goal #6: Shop for a running gift. Yes! We had such a fun Sole2Soul Sisters Christmas party! Goal #7: Write New Year's blog posts. Yes! I decided this year to recap every month of the year instead of just my running. I really like how the post turned out! It was fun looking back at the year! Goal #6: Get back into the routine. I have a feeling tomorrow morning is going to be tough on all of us! Having to get up early is going to be hard since we've all been sleeping in all break! We are also going to have to get back into homework and the swing of things. Goal #7: Get things ready for my ladies basic handgun class. Yes y'all! I'm going to learn how to shoot a gun! My Daddy used to take me shooting when I was younger but it's been a really long time. I'm taking a ladies class this weekend with friends and I'm nervous but excited about it! So that's the plan for this week! It's going to be an exhausting week I can already tell! Getting back into the routine always takes us a few days! I hope you all have a great week conquering your goals! QOTD: What goals are your chasing this week?